RBF Morph, an Ansys Inc. Partner, presented Add-on for Ansys Fluent 16.0, is a allows for shape optimization studies entirely within Ansys Fluent by morphing an existing mesh. This new approach takes advantage of the Ansys Fluent's CFD technology and overcomes the limits of the mainstream methods, by introducing these functionalities through the implementation of dedicated routines in the CFD Ansys Fluent code. A dedicated Graphical User Interface (GUI) has been developed and integrated in Ansys Fluent. The product is CFD users oriented and does not require the knowledge of other software packages. - Product Integration: full integration With Ansys Fluent. - User Interface: dedicated GUI and TUI (scriptable). - Process Integration: morphing directly inside the solving stage without modifying the geometry, regenerating the mesh and setup again the case. - Mesh Topology: modification of the original surface and volume mesh producing a nodal smoothing without changing the mesh topology. - Surface Morphing: surface mesh can be modified by free surface deformation, rigid movement or scaling. - Volume Smoothing: high quality smoothing of the volume mesh With relatively large movements possible in a single step deformation. - Versatility: nodal smoothing is achieved by means of a mesh-less approach that is independent from the mesh structure, handling every kind of mesh element type (tetrahedral, hexahedral, polyhedral, prismatic, hexcore, non-conformal interfaces, etc.). - Reusability: the RBF solution can be applied to any different mesh representing the same geometry. - Consistency: mesh characteristics are preserved so mesh consistency is ensured (element size, type and distribution, prism layers, etc.). - Parallelism: parallel calculation for large models (many millions of cells). - Efficiency: flow solutions are fully readable through all the morphed mesh, reducing the number of iterations to converge. - Precision: exact movement is ensured for the moving nodes locations as well as exact feature preservation. - Parameterization: multi-parameter and multi-step problems. - CAD: transfer modifications back to CAD by applying to STEP files similar modifications done on the mesh, in order to fully support the re-design of the morphed surfaces. We are the pioneers in providing reliable and high-performance mesh morphing-based technology for CAE multi-physics modelling and optimization. The RBF Morph technology, in particular, had its inception when, during an industrial consulting activity, a team of university scientists was required to conceive a novel numerical means capable handle a very challenging application for a Formula 1 top team project. Such a request was motivated by the absence of a tool With the demanded cutting-edge specifications. 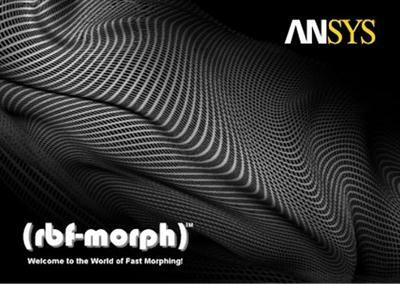 Thanks to the stunning results obtained, RBF Morph entered the Ansys Partnership Program With the aim of promoting the new product. Nowadays RBF Morph tools are the meeting point between state-of-the-art scientific research and top-level industrial needs.